To order records, click here. "Storm", 1995. CD, cassette. 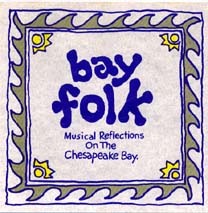 Recorded by Jim Fox, Lion & Fox Recording, Washington, D.C.
"Bay Folk", 1990. CD, cassette. Anthology by various artists (including Mary Chapin Carpenter, David Mallet, Schooner Fare) to benefit the Chesapeake Bay Trust. Produced by McShane Glover, Noteworthy Productions. "Waterside", 1987. CD, LP, cassette. Recorded by Jim Fox, Lion & Fox Recording, Washington, D.C.
"Dramtreeo", 1984. CD, LP, cassette. Recorded by Alan Sawyer, Commercial Audio, Virginia Beach, Va.
All of Dramtreeo's albums have been well received, and have been featured on radio stations across the continent from Bangor, Maine to Vancouver, B.C. and in Europe. Dramtreeo's recordings are distributed world-wide by Southern Branch Music, Norfolk, Virginia, (757) 623-6432. To download an order form, click here.